In 1787 a woman named Mary Cosway painted an amazing self-portrait. It was a portrait of her discontent. Today all that exists of the painting is an engraving by Valentine Green and as a result we must interpret her work partly through the hand of another. Even so, the message in Mary Cosway’s self-portrait is hard to miss. The composition of the piece is much as we would expect and follows the conventions of painting at the time. The three-quarter figure sits side on to the viewer head turned to face us. She is positioned in the same indistinct landscape favoured by many 18th century painters. But the thing that makes this painting so radical is that Mary Cosway sits with her arms crossed! Defying the conventions of body language (back straight, elbows tucked in, hair well coiffed and covered with hat or shawl, etc) was one thing, but clearly portraying yourself as displeased was risky, regardless of one’s social status. In 1760 there had been well-publicised criticism of Thomas Gainsborough and his portrayal of Mrs. Philip Thicknesse (Ann Ford). 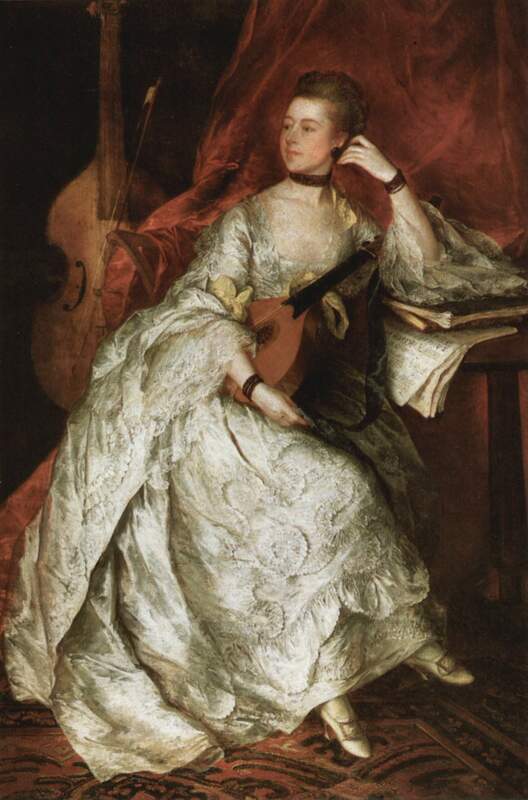 In this portrait Gainsborough painted the musician casually leaning on a pile of manuscripts, legs crossed and an intelligent look on her face (shock, horror!). The Academy were all-in-a-tiss about it and the public openly derided Gainsborough for portraying his sitter in such an ungainly and inelegant manner. The subject, Ann Ford was an independent woman who had attracted public attention herself by defying her father to work professionally as a musician – a great story in itself but a little aside from my main point which is that portraying women as anything other than conservative, moderate and above all chaste was a risk to both artist and sitter. In light of this, we can see how Mary Cosway ran the gauntlet on her self-portrait. The story that lies behind Mary’s discontent is one of a women denied her chosen artistic profession. Germaine Greer in her book, The Obstacle Race devotes several paragraphs to the story of Mary Hadfield Cosway and describes her marriage to the famous English miniaturist Richard Cosway as one of convenience. Apart from being a dreadful gad-about-town with other women, Richard prevented Mary from selling her paintings or working professionally. He preferred her to be available to him and to support his own career as court painter. Quite clearly she resented this and painted it into the portrait! She is on record of saying that her painting suffered as a result of not being able to work professionally. Theirs wouldn’t be the first relationship in history to have significant conflict regarding the place of women in the marriage but what is note-worthy is that Mary Cosway chose to record it in paint. She is telling us her hands are tied; she is unable to do anything about her situation or her whoring husband. Mary Cosway was 19 years of age when accepted into the Academy della Belli Arte in Florence. She was trained by several notable artists and mentored by Angelica Kaufmann and Sir Joshua Reynolds on her relocation to England. According to the entries on the pages of the Fondazione Mary Cosway, the Lodi-based foundation and home to Cosway’s remaining body of work, Mary exhibited over forty paintings at the Royal Academy in her early life. Much has been made of her friendship with Thomas Jeffersen whom she met in France and with whom she corresponded with for over 30 years. She’s an interesting artist and I suspect an undervalued one – I’d love to hear if you know anything more about her? Send me a post.